The Quality of Accounting Information: Relevance or Value-Relevance? 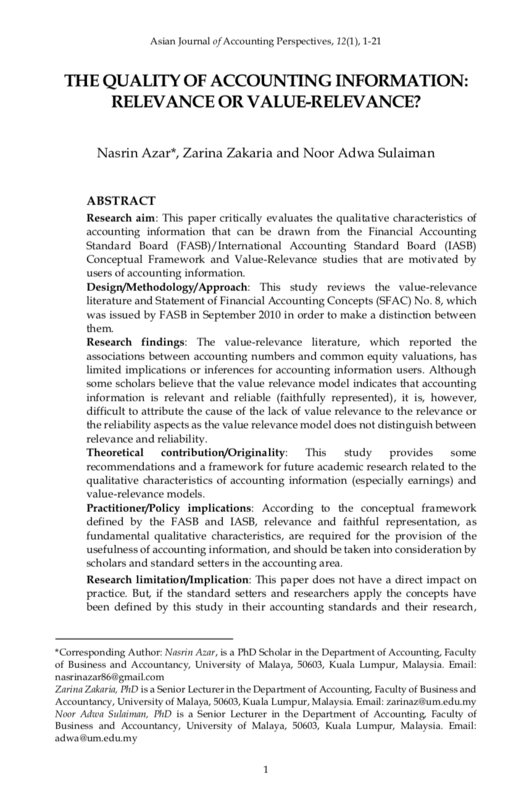 Research aim: This paper critically evaluates the qualitative characteristics of accounting information that can be drawn from the Financial Accounting Standard Board (FASB)/International Accounting Standard Board (IASB) Conceptual Framework and Value-Relevance studies that are motivated by users of accounting information. Design/Methodology/Approach: This study reviews the value-relevance literature and Statement of Financial Accounting Concepts (SFAC) No. 8, which was issued by FASB in September 2010 in order to make a distinction between them. Research findings: The value-relevance literature, which reported the associations between accounting numbers and common equity valuations, has limited implications or inferences for accounting information users. Although some scholars believe that the value relevance model indicates that accounting information is relevant and reliable (faithfully represented), it is, however, difficult to attribute the cause of the lack of value relevance to the relevance or the reliability aspects as the value relevance model does not distinguish between relevance and reliability. Theoretical contribution/Originality: This study provides some recommendations and a framework for future academic research related to the qualitative characteristics of accounting information (especially earnings) and value-relevance models. Practitioner/Policy implications: According to the conceptual framework defined by the FASB and IASB, relevance and faithful representation, as fundamental qualitative characteristics, are required for the provision of the usefulness of accounting information, and should be taken into consideration by scholars and standard setters in the accounting area. Research limitation/Implication: This paper does not have a direct impact on practice. But, if the standard setters and researchers apply the concepts have been defined by this study in their accounting standards and their research, respectively, the results of those standards or research can be finally useful for the practice, especially for the investors. AZAR, Nasrin; ZAKARIA, Zarina; SULAIMAN, Noor Adwa. The Quality of Accounting Information: Relevance or Value-Relevance?. Asian Journal of Accounting Perspectives, [S.l. ], v. 12, n. 1, p. 1-21, feb. 2019. ISSN 0128-0384. Available at: <https://ajap.um.edu.my/article/view/16885>. Date accessed: 20 apr. 2019.